It's no secret that a lot of marathons seem pretty over-priced. There's nothing wrong with spending a little more every once in a while on a powerhouse marathon like the Rock & Roll series, but sometimes it's hard to justify continuously spending $100+ to sweat your body weight during 26.2 miles of bittersweet torture (mostly just sweet, though). The cost of marathons can add up, especially if you're a junkie like we are at MPgear. Want to get your marathon on in 2014 without breaking the bank? We've got you covered. Check out our awesome list of great Washington marathons -- all under $50. This run is great for beginners or any marathoner who is looking for a more relaxed trail. The terrain is pretty flat and mostly wooded, which is great to shade you from the springtime sun rays (sunshine is always great until mile 15 or so…) It’s only $48 to register, so go for it! It’ll be a fun way to say goodbye to spring and welcome summer with open arms. The Teanaway Trail rests between the Wenatchee National Forest and farmland, and is a great spot for spotting wildlife (and wildflowers, since the marathon is in June!) Apparently you can spot wild wolfpacks around this area, so hopefully you’re a fast runner… (just kidding. But I’m serious about the wolves). This race is $46 until April 26th, so make sure to register soon if you want that discount. I wanted to run this marathon last year but it sold out pretty quickly. I definitely plan on running it this year though! I think it’ll be a great race because it’s flat for the most part but still has a few steeper hills to add some challenge. 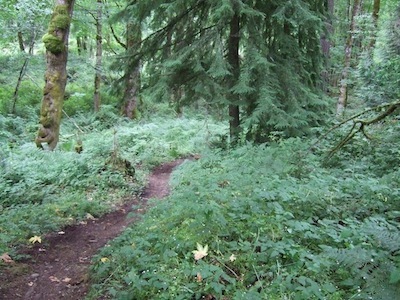 The course is throughout the Redmond Watershed Preserve which is wooded and beautiful. Before July 25th the fee is only $43, which is a great deal! DO it. The best part about this marathon? Food trucks. And live music. And food trucks. Seriously though, this race is a must for a couple reasons (besides the food trucks). 1. I can’t think of a better month for a marathon than September. It’s still warm but the sun won’t be blazing. 2. The leaves are barely starting to turn which will be beautiful. 3. Breathtaking views of Mt. Rainier for some of the race. 4. It will be a wonderful and memorable way to say goodbye to summertime. This race is pretty flat and relaxed, which is also nice. The fee is $48 before Sept. 14th. This marathon is great for a number of reasons. 1. It’s in October, which is a beautiful month in the PNW. I actually prefer running in the chillier months when I’m going for long distances. You can’t beat the sea of fall colors, either. Ft. Steilacoom Park is located just south of Tacoma, Washington and has hundreds of trails throughout open fields, lakes, and forests. This won’t be a very difficult course — it’s pretty flat for the most part. Registration is $48 before October 5th. Good luck on your races! And whichever marathons you end up running this year, make sure you have all the right gear. Let us get you all set with some great deals at mpgear.com! Also, don’t forget to come say hi on Twitter, IG, and Facebook.